Air travel is of most concern to pet owners. You can minimize the chances of an unpleasant experience by following a few guidelines. Federal regulations require that pets be at least 8 weeks old and weaned at least 5 days before flying. Generally, a health certificate (which is not more than 10 days old) must be available before pets will be permitted to fly. A valid rabies vaccination certificate will also be required. Contact the airline well in advance for specific regulations and to secure your pet's reservation. Try to book a nonstop, midweek flight and avoid plane changes if possible. During warm weather periods choose early morning or late evening flights. In colder months, choose midday flights. Arrive at the airport early, exercise your pet, personally place it in its crate, and pick up the animal promptly upon arrival. Do not take leashed animals on escalators. Be large enough to allow the animal to stand (without touching the top of the cage), turn around, and lie down. Be strong and free of interior protrusions, with handle or grips. Have a leakproof bottom that is covered with plenty of absorbent material. Be purchased in advance so the pet can become acclimated to the crate prior to travel. Be appropriately and clearly labeled. Include your name, home address, home phone number, and destination contact information, as well as a designation of "Live Animals," with arrows indicating the crate's upright position. Be ventilated on opposite sides, with exterior rims and knobs so that airflow is not impeded. Ask your veterinarian for specific feeding instructions. 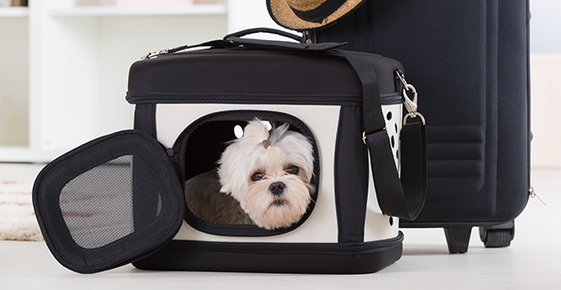 For your pet's comfort, air travel on an almost empty stomach is usually recommended. The age and size of your pet, time and distance of the flight, and your pet's regular dietary routine will be considered when feeding recommendations are made. "We are not from the area but we heard wonderful things about Dr. McKee and his staff at Southwest Animal Care Complex -- so we took our 13 year old Great Dane Mix for a removal of an enormous tumor on his leg. Other places told us our beloved dog may lose his leg if we tried to remove the tumor. We are happy to report our dog had a successful surgery and is walking around just fine. Dr. McKee and his team did a great job in making us feel comfortable during such a stressful situation for our family. We value his surgical experience and expertise! Thank you Dr. McKee and everyone at Southwest Animal Care Complex for making Bubba comfortable again! P.S. He already misses the grilled chicken treats!"